Shop for Instant Nirvana !!! 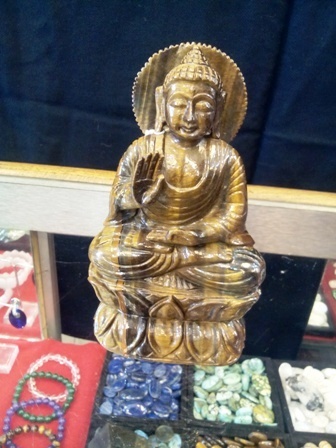 Product No BUD002, is the statue of Tiger Eye Blessing Buddha (also known as Buddha of Luck) symbolizing long-life, good health and healing. The statue is a pure precious tiger eye stone figurine, hand made and carved by Buddhist artist. The Buddha is shown with his upraised palm in a Blessing Mudra; blessing the universe for long life and prosperity. He is shown on lotus seat with a hand-crafted tibetan buddha crown. Height: 06 inches, Length: 03 inches.